The St George Rainway Project is a community driven initiative that seeks to recall a historic waterway in Mt. Pleasant. 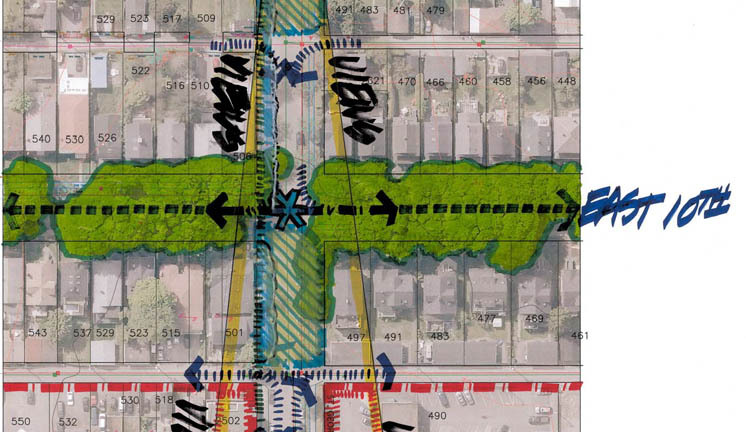 The goal is to use rainwater runoff from adjacent properties, the street, and connecting laneways to recreate this lost stream as part of a "Rainway" along St. George St. from Kingsway to the False Creek Flats. Through a range of community events we have worked with diverse stakeholders to envision what a green redesign of the headwaters of te Statlew, the little creek also known as the St George Rainway, could look like. Imagining the Rainway (11th and St. George). In addition to naturalizing the streetscape and drainage, the community is creating opportunities for artistic expression, educational activities, urban agriculture, and community gatherings. This initiative is both an engineering and community-building project. In the summer of 2013, the rainway concept was included in the official community plan for the Mt. Pleasant Neighbourhood. A portion of the concept plan developed in collaboration with city staff. The stream 'daylighting' project draws inspiration from other projects around the world which have brought hidden creeks and rivers back to the light of day. An example in Vancouver is Still Creek, and the most compelling example comes from Seoul, Korea - where a freeway was torn down to revive an historic river. From Freeway to River: The Cheonggyecheon River in Seoul Korea. The rainway concept includes parts of the street that would be converted to one-way traffic. Do you want to see water brought back to the False Creek Flats in some way? Share your ideas through the City of Vancouver's False Creek Flats planning initiative.